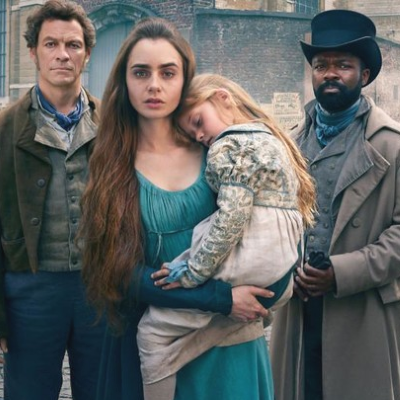 The PBS Masterpiece six-part series starring David Oyelowo, Dominic West, Lily Collins and Olivia Colman is "not the musical, nor is it the clumsy movie version featuring Russell Crowe and Anne Hathaway warbling away about love and dignity and stuff like that," says John Doyle. "It is a new six-part British dramatization of Victor Hugo’s original novel, deftly done by Andrew Davies." He adds: "There’s nothing shabby about this forceful series. It has a formidable visual sweep that starts with a stunning overhead shot of the aftermath of the Battle of Waterloo. All the dead, all the killing, and for what? The on-screen intro says this: 'After 20 years of war, France is defeated and Napoleon is exiled. A new king is waiting to be crowned. The old order is to be restored. The revolution is to be forgotten.' Then we are thrust into the main characters and main ingredients of the story."